I. Agriculture is not separate from the environment. The term “agriculture” represents diverse and evolving traditions, practices, relationships and knowledge by which humans interact with the environment in order to provide food, fiber and fuel for our communities. All agriculture depends upon and has a significant impact on living ecosystems. II. During the past fifty years, conventional agriculture has been transformed into an industry that is focused almost exclusively on maximizing yields and increasing profits. To this end, chemical, biological and mechanical technologies have been developed and promoted with the promise of providing total control over natural processes and extricating agriculture from the environment. Wide spread adoption of these technologies, along with increased consolidation and expansion of production and distribution systems, has had devastating consequences for farmers, consumers, economies, communities, animals and ecosystems. III. The current trends in conventional agriculture are not sustainable. In order to survive, we must recover, create, establish and support alternative agricultural traditions practices, relationships and knowledge that reconnect human communities with living ecosystems. 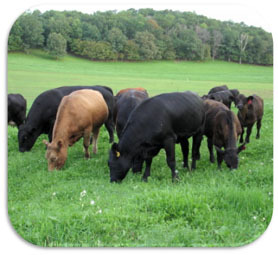 V. Managed grazing is an economically viable and earth friendly method that can be utilized by new as well as established farmers, implemented for any livestock species and adapted for any ecosystem that grows grass. As such, this method should be central to a sustainable agriculture movement that values the environment and biodiversity, animal welfare, public health and nutrition, local food systems, social justice and the viability of rural economies and communities. VI. As sustainable farmers, we work with the grass because it flourishes almost effortlessly, capturing and transforming sunlight. Grass is an endless gift, which heals the land and sustains the animals that feed us.